Globe Pequot Press, 9781493037117, 264pp. *NOT FINAL COPY* It's no surprise that the historic Massachusetts seaport's history is checkered with violence and heinous crimes. Originally called Naumkeag, Salem means "peace." However, as its historical legacy dictates, the city was anything but peaceful during the late seventeenth century. Did the reputed Boston Strangler, Albert DeSalvo, strike in Salem? Evidence supports the possibility of a copy-cat murder. From the recently pinpointed gallows where innocents were hanged for witchcraft to the murder house on Essex Street where Capt. 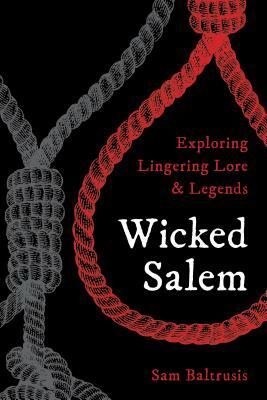 Joseph White was bludgeoned to death and then stabbed thirteen times in the heart, Sam Baltrusis explores the ghost lore and the people behind the tragic events that turned the "Witch City" into a hot spot that has become synonymous with witches, rakes, and rogues. Sam Baltrusis has been featured as Boston's paranormal expert on the Biography Channel's Haunted Encounters, Destination America's Haunted Towns, and the Travel Channel's Haunted USA. As a side gig, Baltrusis moonlights as a guide. He has launched the successful ghost tours Boston Haunts and Cambridge Haunts and worked with Essex Heritage leading tours to Salem's Bakers Island lighthouse. He also led groups with Essex Heritage's "Myths & Misconceptions" and the Wicked Salem walking tour. Baltrusis is a sought-after lecturer who speaks at dozens of paranormal-related events scattered throughout New England, including an author discussion at the Massachusetts State House. Plus, he is the producer of the Provincetown ParaCon. He is the author of Ghosts of Salem: Haunts of the Witch City and several other books on the paranormal in the northeast. He lives in Somerville, Massachusetts. Visit SamBaltrusis.com for more information.